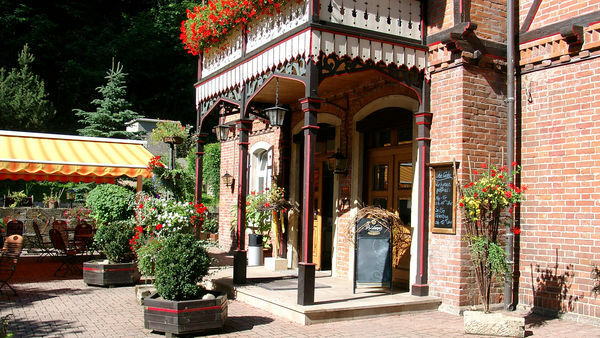 Situated right across Rabenau station on the Weißeritztalbahn railway line running from Freital-Hainsberg to Kipsdorf health resort, the Rabenauer Mühle restaurant has been popular among hikers and railway enthusiasts for a long time. The mill complex was mentioned as a large-scale mill in a document for the first time in 1235. First it was part of the local castle and later became an electoral mill. The Rabenauer Mühle was given the right to serve alcoholic beverages in 1830. In 1869, the mill burnt down and was rebuilt as a restaurant and groundwood mill in Swiss style. The Schumann family bought the mill in 1990 and enlarged it into a hotel. Now guests of the hotel’s restaurant can enjoy elegant dining in a pleasant environment. If you would like to have a family party, association meeting or conference of up to 70 people, please contact us so that we can help you prepare for a successful event. Our place and its romantic surroundings will convince you that you made the right choice. To be active or to relax, visit our bowling lane with clubroom or the attractive wellness area. Also more and more railway enthusiasts have discovered our hotel and restaurant. Since 13 December 2008, six years after the hundred-year flood, trains have been running again on the By now, the stretch to Dippoldiswalde is finished, but service to Kipsdorf is planned, too. A hiking trail along the Weißeritz river, through Rabenauer Grund valley passes the Rabenauer Mühle, where many hikers like to rest or get on the narrow gauge railway. The Rabenauer Mühle is a place with many options and a real treasure in the Eastern Ore Mountains for its unique architecture.